The Favorites is a series briefly exploring films I love, to find out what makes them - and me - tick. Vertigo (1958/USA/dir. Alfred Hitchcock) appeared at #3 on my original list. What it is • In the opening minutes of Vertigo, Det. James "Scottie" Ferguson (James Stewart) experiences his first, but not his last, trauma, nearly falling from a tall building - and then watching as the police officer who tries to save him actually falls to his death. For the rest of the film, he suffers from acrophobia, a fear of heights so debilitating he can't even look out the window of his apartment without collapsing. An old friend, Gavin Elster (Tom Helmore) offers him a job to relieve the tedium of his unexpected retirement. Elster's wife Madeleine (Kim Novak) has been acting strange - she may in fact be possessed by the spirit of an ancestor, Carlotta Valdez, an Old San Francisco beauty who was scorned by her husband and separated from her child. This is a Hitchcock movie, and Hitchcock movies, however eerie and tense they get, don't usually dabble in the supernatural. Nevertheless, as Scottie immerses himself in the Elster mystery he does seem to be uncovering a case of genuine possession. He falls in love with Madeleine, an aloof, aristocratic blonde, vowing to keep her safe. And then... Well, I saw the film without knowing much about it and I'd recommend you do the same if you can. Stop reading now, and seek the film with a fresh curiosity (jump to the "How you can see it" section to find a convenient option). Only if you have watched Vertigo, or have already had it spoiled, should you keep on reading. After losing Madeleine, Scottie disappears into a fog of regret and anxiety, a catatonic state which, when he finally emerges, leaves him an emotional cripple obsessed with the past. He meets Judy (also Kim Novak), an earthy brunette, nothing like Madeleine...except that she does looks a bit like her. If just for her hair...or her clothes...or her manner of speech. Vertigo's trailer presents this character as a distinct individual and the film could easily play into that expectation. Instead Hitchcock does something far more interesting - something he hesitated to do, only acquiescing when his wife/lifelong collaborator Alma urged him to trust his initial instinct. With a good half-hour or so remaining, Vertigo reveals that Judy is Madeleine; or rather, there never was a Madeleine, not that Scottie knew anyway. In the recent documentary Hitchcock/Truffaut, an interesting survey of the American auteur's method, the commentators all concur that Vertigo is - for better or worse - exclusively interested in Scottie's perspective. I find this opinion confounding. 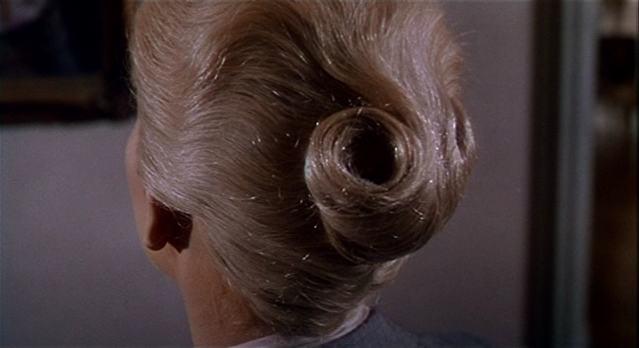 The big twist of Vertigo is that we learn Judy's secret long before the climax. Therefore from this point forward, while we may sustain a lingering sympathy with Scottie, if we are paying attention our sympathy is just as likely to shift, irrevocably, to her. This is a powerful subversion of the preceding film; as the fantastic recent episode of the Projection Booth podcast observes, Judy's flashback changes everything. Prior to Steven Spielberg, no director had greater name recognition than Hitchcock, but Vertigo perplexed critics and audiences. It remained hard to see for close to forty years, finally getting a major restoration in the late nineties. Now Vertigo's star has ascended; in 2012, it became the first film in fifty years to surpass Citizen Kane on the Sight & Sound poll. Today it is regarded by a wide swathe of critics as the greatest film of all time. I think I got into Hitchcock about a year before my second major bout of cinephilia (stemming from the AFI Top 100 in the summer of '98). I had seen The Birds earlier, and it hadn't done too much for me despite the fantastic premise. Spellbound, a much less celebrated Hitch film, did the trick instead. Captivated by the idea of unlocking a dark psychological mystery, I was primed for more. Notorious, while lacking the mystery element, compelled me with its portrait of neurotic Nazis condemned by the polite incantation of their partners: "I wish to talk to you." Rear Window, the only other Hitchcock to make this Favorites list, initially disappointed me: the mystery wasn't hard to crack, nor was it particularly psychological (at first glance). And then there was Vertigo. As I've said above, I knew very little about this film going in. When I finally saw Psycho, I had the entire plot - not just the shower scene but the final twist - spoiled ahead of time. I still enjoyed it immensely, but it wasn't quite the same as Vertigo. I distinctly recall, after "Madeleine" fell to her death from the tower, wondering, even dreading, if "this was it." I didn't want the film to end, but I recognized that the plot that had been set up was now over. And then...it kept going. And going. I sat on the edge of my seat, eager for it to continue though it seemed at any moment it might stop, sensing on some level that there was much more to dig into. And was there ever. Few works of art - maybe only Twin Peaks - have kept me in suspense and then surprised me to the extent Vertigo did. I was genuinely stunned by its big reveal and drawn all the more inexorably to its tragic conclusion. The gloomy romanticism resonated with me, and I saw the film many more times. Though I don't remember ever seeing it in a theater, my two screenings with wider audience were disillusioning. The first time, with an older audience in a public library, I was stunned that the other viewers treated the film as a comedy, a feature-length episode of the frequently tongue-in-cheek Alfred Hitchcock Presents. The second time, with a much younger audience, the viewers dismissed the movie as a bizarre, nonsensical oldie. I remain ever grateful that my initial experience with Vertigo was so indelible and immersive. Many of my favorite films didn't work for me on first viewing and that's ok - they wound up here anyway! But there's something to be said for a first contact that's so startling it never leaves you. More from me • I explored Vertigo's connection to Twin Peaks in two chapters of my Journey Through Twin Peaks video essay series: "Who is Laura Palmer?" and "The Usual Suspect". I (sort of) reviewed the film as the last entry in my "Big Ones" series, deleting my initial essay and replacing it with a meditation on blogging, thoughts on a video essay called Vertigo Variations, and, yes, some notes on the film itself. A clip appears at 3:16 in "The Wide View", a chapter in my "32 Days of Movies" video clip series. How you can see it • Vertigo is available for digital rental/purchase on YouTube, Amazon, iTunes, Google Play, and other sites, and can be rented on DVD from Netflix. What do you think? • Did you see Vertigo without knowing the twist? Do you see a connection, and evolution, in Hitchcock's collaborations with Stewart? Of the many works Vertigo has influenced, which do you find the most interesting? After all these years, it is my favorite film. I first saw it in a film 101 class in college, where we watched a 16mm print. It was enigmatic and gave me everything I needed: dreamlike mystery, doomed love, that amazing score, the futile attempt to make a woman into an ideal one and destroying her in the process. This was around the same time as Twin Peaks being on TV and so the echoes were definitely heard: the blonde and the brunette, the names, the subtle use of traffic lights. There's one moment that passes by quickly, but I love. It's when they visit the redwoods and Madeline walks off after touching the tree rings. She simply walks behind a tree, but on that first viewing it's like she literally vanished. I got goosebumps from it. (Lynch performs the same trick in Mulholland Dr. where Laura Elena Harring steps out of frame (i assume behind the camera) and disappears completely from the film). So simple, so effective. Much later I watched "La Jetee" and saw the echoes in that film, including the tree rings, a ghost of the future in the present, and even shots of the back of the actresses head. coming about 3 or 4 years after Vertigo, it shows that some people were picking up on the power of this film. That is pretty cool - thanks for sharing it. Have you seen Sans Soleil, out of curiosity?